We are 50 years old this year but, with a full year of productions, it was not until the end of the year that we could find time to celebrate. We were so close to Christmas that we combined it with our Christmas party which was held at The Bull in Highgate. All our members were invited but we also invited former members who had made a significant contribution to the group. It was a great opportunity for members old and new to chat and reminisce. 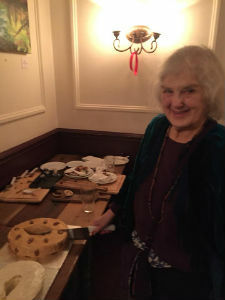 Judy Burgess, one of the founding members, was given the honour of cutting the celebration cake. Alan Hooper surprised us all by giving us a DVD of some early productions (which we will endeavour to find a way to show here on our web site). 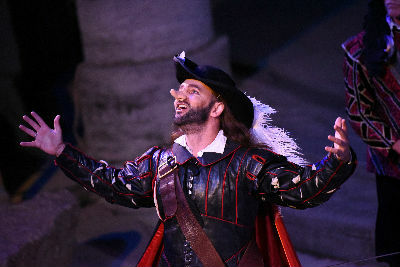 It has been a very long while since we took such a large contingent of cast, crew and friends to the Minack, so many of our members will have been involved in some capacity with Cyrano de Bergerac. 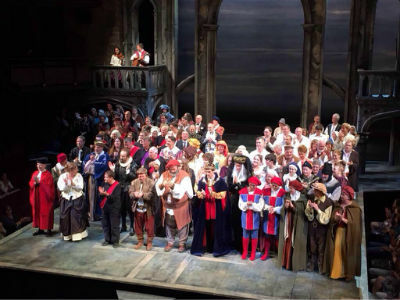 I am happy to tell you that the show was very well received by all our audiences, and that attendances were good enough to ensure a satisfactory return for all the hard work. This despite the fact that we did not enjoy the perfect, idyllic weather that we experienced three years ago. A roll-call has happily confirmed that none of our members was actually blown off the cliff or dissolved by rain, but we did encounter some inhospitable conditions. Fortunately the audience, ensconced in their waterproofs in that wonderful English way, did not appear to mind and awarded us extra brownie points for soldiering on (literally, as the battle scene seemed particularly prone to onslaughts from the weather). It is a theatrical experience unlike any other, and if you never been, I encourage you to do so when we return to the Minack. Meanwhile, congratulations to John Savage (our director) and all those who conspired to make the whole week so memorable. We start the year with the sad news of the death of Alan Jobson. 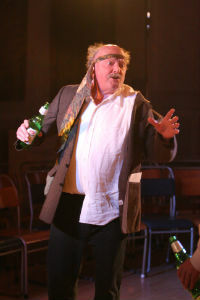 Alan was such a character and we will always remember him very fondly and certainly never forget his Falstaff in 'Love, Lust and Lies'...a part he was born to play! We have some great photos of him in various roles which we will share. It is so very sad to hear this but we are consoled in the knowledge that he remained so active in theatre throughout and derived and gave so much pleasure from that. Also that he no longer has to miss his beloved wife whose loss we all know never got any easier for him despite the passing years. Our monthly social gathering at the Bull in Highgate took a different direction in November when gather for a quiz. It is quite a number of years since we last tested our theatre and general knowledge. Breaking conveniently into four groups of of four, the teams were tested on history and geography, art and literature, dramatic synopsis, music and entertainment and theatre. We will avoid reporting who were the clever clogs and who earned the 'wooden spoon' but only that everyone had a great evening. 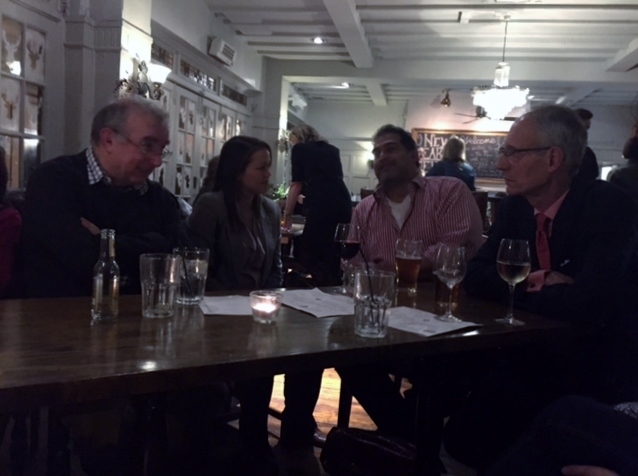 On December 10 our end of year gathering was a more informal affair at the Old White Lion in East Finchley. It was a time to drink and chat and review what 2015 had brought and 2016 held in store. Our next 'Pub Performance' will be at the end of January when we will return to play reading with Moliere's The Hypochondriac which are looking to perform in summer 2016. This is a private read-through for members only to determine it's suitability. 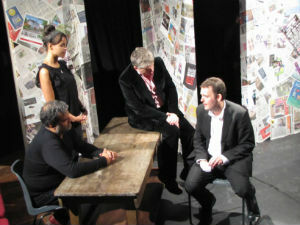 The group's production of How to Disappear Completely and Never Be Found has completed and has proved to be every bit as successful as we had expected. There were exceptional performances from the cast but especially from Matthew Pert who took the lead role of Charlie and barely left the stage throughout the performance. This was our first performance at this venue and we had to get use to the new theatre space but cast and crew rose to the challenge. The audiences were drawn into the intriguing, disquieting drama, appreciating the poignant, darkly humerous dialogue and complex issues. Well done to director Colin Joseph, cast and crew for taking the group artistically in a different direction and proving that we are accomplished in a wide range of dramatic styles, contemporary as well as traditional theatre. Dickens featured in our 2014 season with our production of Great Expectations. So when Linda Shannon suggested that we make a visit to the Dickens Museum for a costumed guided tour we asked her to make the arrangements. Seven of us made the trip to Doughty Street in Bloomsbury area of London. We were greeted at the door by the housemaid who informed us that Mr & Mrs Dickens were in Broadstairs and that she would be happy to show us around. It was a delightful tour full of delightfully recounted anecdotes which put over a lot of information in a most engaging manner. 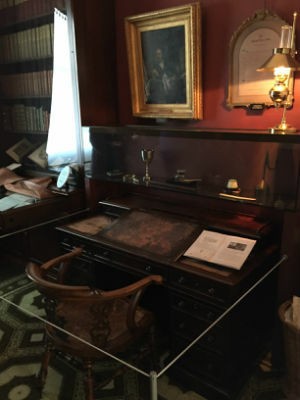 It was uncanny to find ourselves in the study where Dickens had written The Pickwick Papers, Oliver Twist and Nicholas Nickleby, the drawing room where guests were entertained and the bedroom where his sister-in-law had died unexpectedly. Sunday mornings can often be boring. 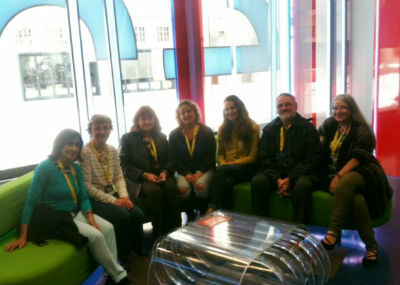 Not so for ten Tints’ members who, on 27th September, did a tour of the BBC buildings, read the television news, did the weather forecast and recorded a radio play. Well, they were all dummy performances of course, but it was all great fun. We learned about how news was gathered and presented, along with the long history and traditions of the BBC. We sat in the radio theatre, where many famous people had performed, from the Goons to Elton John, and many had begun illustrious careers there. Talking of illustrious, Nim helped to read the news and Alison D presented the weather [without a script – brilliant! ], while Alison L and your correspondent took part in a recording of a short spoof horror play with Alison D backing us up with a number of sound effects. We ended by all sitting on the green sofa of the One Show. Our guide, Simon, let us in to all sorts of secrets as to how things are done and we came away with much greater insight as to what goes on behind the scenes. Not only that, he was interested in our next production and we-emailed him the flyer – who knows where that could lead! For TintS members, the summer social season may not include Henley, Wimbledon and Glyndebourne, but is just as stylish. 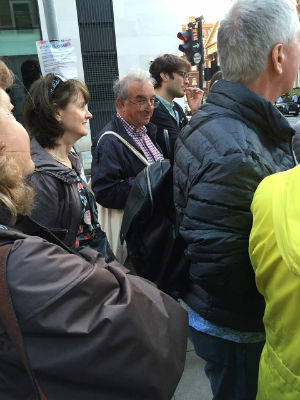 After our sunny picnic in Waterlow Park last weekend, we hit the streets of London on Wednesday 26 August, 2015 for our literary pub walk. Slightly misnamed, because there was only one pub on the route (though we made up for that afterwards) but also because we learned about a lot more than London literary figures. As well as hearing about Dickens, Thackeray, T S Eliot, George Orwell, Virginia Woolf and many others, our guide expounded on everything from the numerous ailments of George III (and the extreme remedies used to treat them) to Johnny Depp's connection with Great Ormond Street Hospital. There is still time to get involved in the TintS social whirl. On Thursday (3rd September) we set off to explore London again on our murder mystery trail. Linda will be sending round joining instructions, and we hope to see a lot of you there. We were lucky again for our annual visit to Waterlow Park as the weather (which has been mixed this summer) blessed us with a minor heart wave. We found ourselves a shaded area and settled for the afternoon in relative seclusion. As usual there was far too much food and such a wonderful choice. When we were replete, we started to read our chosen play, 'Lystistrata', for our own amusement. While there was a good turnout, there were not quite enough readers to match the available roles, so many had to double up and, by the end of act two, the men were reading the women's roles and visa versa. There was much hilarity and mirth as the bawdy comedy unfolded and we all agreed it had been a jolly good afternoon. Some then repaired to The Bull, who were having their birthday party. Thanks to Guy for making the arrangements and to Jane for organising the reading. See Membership Events to see what's coming up and join in our social events. There were a large number of people attending the the auditions for 'How to Disappear Completely and Never Be Found' more than twice as many as the parts available. Not only that but the standard was exceptionally high making the casting decisions difficult to make. This has meant that a number of those auditioning have been unlucky not to have been cast. All the other roles will be played by Adam Baxter, Elicia Davies, Alison Dobin, Stephen Forster, Matt Lavender, Jade Linlee, Guyene Muneesamy and Lara Southwell. Congratulations to all the successful candidates and well done to all who auditioned. 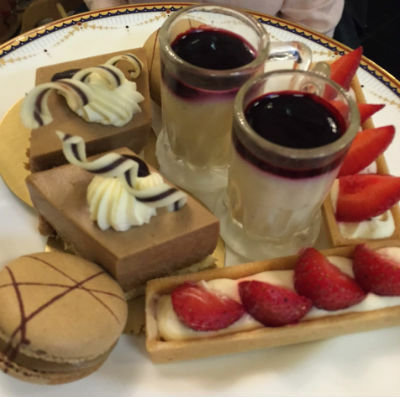 On Sunday 16 August a few of us indulged in a little luxury (well we thought we'd earned it) when we gathered at The Waldorf Astoria for a Champagne Tea. 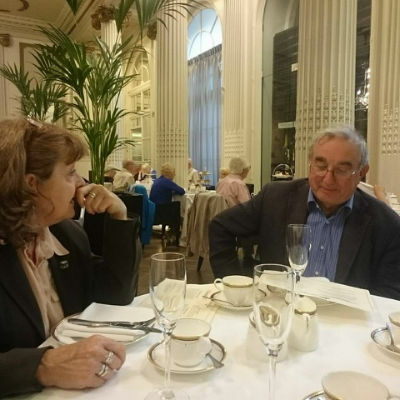 In the opulent surroundings of this luxury hotel with crystal chandeliers, mirrored walls and uniformed waiting staff, we were shown to a table (resplendent in white linen) and sat in comfort close to a harpist who kept us entertained with some of Debussy's 'greatest hits'. We started with a glass of champagne which was refreshing on a warm day. Dainty sandwiches followed (including that most English of fayre, cucumber). There was more if we wanted and we didn't disappoint. There was a fine selection of loose-leaf tea available served in a bone china tea pot for each person and a clever device called a tea strainer (for those of you used to tea bags) which removed the leaves as the tea was poured into bone china tea cups. Finally, a three-tiered cake stand arrived with a splendid array of delicate pastries, cakes, entremet and scones (with cream and strawberry conserve). The conversation that flowed during tea was varied but dominated (as you may expect) by matters theatrical. We toasted the group and wished it continuing success it its theatrical exploits. Thank you Linda for making all the arrangements. For one night only Theatre in the Square members got to be RSC actors/musicians and I think it is fair to say that everyone involved had a wonderful time. The RSC were incredibly welcoming and supportive and treated everyone like VIPs, looking after our every need. Over the weekend, TintS had dedicated rehearsals with several directors and a session with their head of voice and text in addition to incredible technical support and a mass warm up on the stage before the show. They also laid on a fabulous post show party! Everyone was impressed with how hospitable and friendly the RSC professionals all were, especially as they had all given up their free time to run the event. There were around 140 people involved in the showcase from around the UK and it was wonderful to meet so many enthusiastic am-drammers and to see the quality of everyone's work. The atmosphere was all very celebratory backstage. 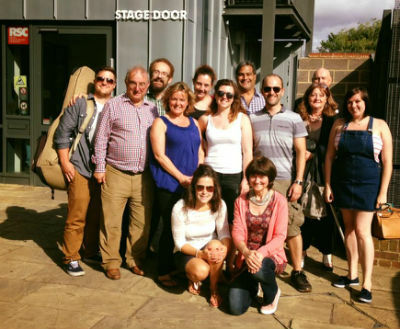 It was also lovely that several people involved in our original production made the trip to Stratford to support the group and were able to join us for the post-show party. 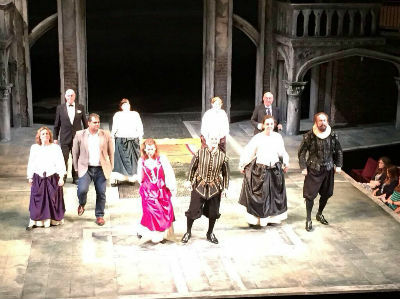 From the perspective of the performance, our excerpt from 'What She Will' had a brilliant reception from the audience and great feedback from the RSC. As director, I was incredibly proud of all the cast and musicians who put on a really professional show and got the loudest applause of the night! The showcase was a fantastic end to this two year long project and all it remains for me to do is to thank all the very many people involved, from coming to the initial workshops to all the cast, musicians and crew of the production. I think it is a testament to the commitment and enthusiasm of the group that the whole project has been such a success and that the RSC has defined TintS through its selection for participation in the showcase as one of the 'leading amateur companies' in the country! To see more photgraphs of the showcase, click HERE.